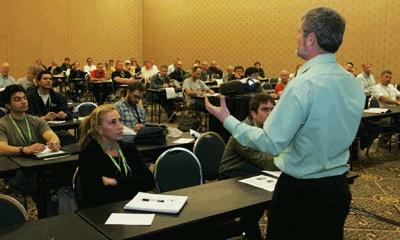 Use this page to view many of Shawn's Past Seminar Topics and the Industry Events where they were presented. Shawn offers Seminars, Workshops, Educational Presentations and Custom Educational Programs for the Remodeling, Home Improvement and General Construction Industries. He offers a variety of topics for Contractors, LBM Dealers, Product Manufacturers and others involved in the Construction Industry. Shawn also offers educational and key note presentations for other industries and groups. "I really needed help understanding the financials of my business and this course really helped me with that." "It was awesome. Exceeded my expectations. Will attend this seminar every year from now on." "Your help was greatly appreciated and helpful. I have enjoyed some of your seminars at the JLC LIVE show and have been thankful for someone like yourself keeping people like me in the industry informed not only about RRP but about the business side of our work. Thank you again for your help and keep up the great work." "Great information related to my real world. Best info for costing and selling jobs." "Everything was great. I realized how sloppy my cash flow situation is even though I had lots of volume." "Great simple explainations and useful forms"
"I attended a couple of Shawn's sessions at the Remodeling Show in Chicago last fall. One of my favorite presenters and I appreciate how he approaches business."